England captain Joe Root says his side are still charge of the series against India despite their third-Test defeat. India’s 203-run win at Trent Bridge cut England’s lead to 2-1 in the five-match series, with the fourth Test in Southampton beginning on 30 August. “We’re in the driving seat as far as the series goes – we have to remember that,” said Root. England’s defeat in Nottingham was as a result of a horrible batting collapse in their first innings, where they lost all 10 wickets in a session to be bowled out for 161. Root added: “We have got a little bit of time to reflect on what has been a difficult week, but in England we are a very good side at bouncing back from a tough couple of days. Batting collapses have blighted England’s Test cricket in recent years – this latest slump was the third time since 2016 that they have lost all 10 wickets in a session. In all, they have lost their fourth wicket for less than 100 runs in half of their past 62 Test innings. “We sat down and spoke honestly about how we’re going to get this right,” said Root. “It has happened on a couple of occasions and obviously isn’t good enough. 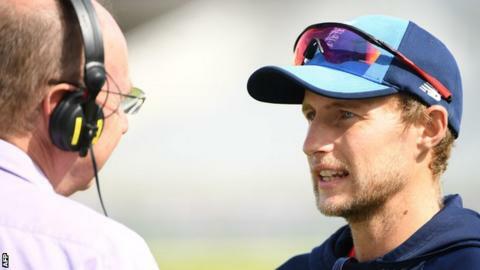 Root also gave his “100%” backing to former captain Alastair Cook, who is England’s all-time record run-scorer in Tests, but averages only 19.21 with the bat in 2018. “He is a world-class performer,” said Root, 27. “I want the media to write him off because every time they do he comes back and scores a double hundred. Root said he expects Cook, 33, to be available for the fourth Test despite the imminent arrival of his third child. The captain also said that England will wait on the fitness of Jonny Bairstow, who suffered a broken finger whilst keeping wicket at Trent Bridge. “It’s early days and will have to see how that settles down,” added Root. “We have got a bit of time before the next game, so can assess it further down the line. If Bairstow is ruled out, England may opt to recall Moeen Ali, who made a double century against Root’s Yorkshire on Tuesday.